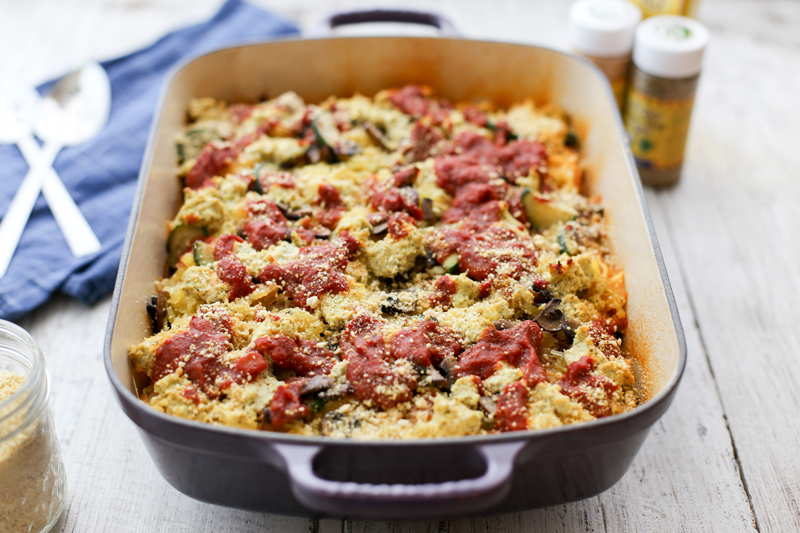 Spaghetti squash is a healthful, low-carb substitute for pasta, and it’s the star ingredient in this delicious lasagna! Each layer is well seasoned with Garlic Gold® Nuggets and Oil, so the lasagna has savory, roasted garlic flavor in every bite. It’s the perfect introduction to spaghetti squash, pleasing vegans, vegetarians, and omnivores alike. Oh, and we even use our Sea Salt Nuggets to make the ultimate topping — a vegan Parmesan “cheese” that’s better than anything you can buy at the grocery store. You’ll have some left over to sprinkle on pizza, pasta, popcorn, or anything you please! Prepare the spaghetti squash: Preheat the oven to 375ºF and line a baking sheet with a silicone mat or parchment paper. Position the oven rack in the middle of the oven. Use a sturdy chef’s knife to cut the spaghetti squashes in half lengthwise. Scoop out and discard the seeds. Drizzle each squash half with a tablespoon of Garlic Gold® Oil, and season with salt and pepper. Place the squash cut side down on the lined baking sheet. Bake the squash for 45 minutes, until the flesh is soft and easily pierced with a knife. Remove it from the oven and allow the squash to cool until it is comfortable to handle, about 45 more minutes. Use a fork to scoop out the strands of spaghetti squash into a large bowl. Taste for seasoning, adding additional salt, pepper, and/or Garlic Gold® Oil to your liking. Sauté the vegetable filling: In a large (12-inch) skillet over medium heat, heat two tablespoons of Garlic Gold® Oil. Add the mushrooms and sauté until they begin to soften, about five minutes. Add the zucchini and salt and sauté for another five minutes. Turn off the heat and set aside to cool. Make the vegan Parmesan “cheese”: In a food processor, combine the cashews, nutritional yeast, and Garlic Gold® Sea Salt Nuggets. Process in five one-second pulses, until the mixture resembles Parmesan cheese (the kind in the green can). Transfer to a pint jar or other tightly lidded container. Make the tofu “ricotta” filling: Cut the tofu into ½-inch slices. Place the slices on a doubled paper towel, and place another doubled paper towel on top. Place a large weight (you can use the lasagna pan for this) on top, and leave it to press the tofu for 20 minutes. While the tofu is being pressed, combine the cashews, Garlic Gold® Italian Herb Nuggets, nutritional yeast, basil leaves, salt and pepper in the food processor. Process in five one-second pulses, until the cashews are fully ground into the other ingredients. Add the tofu, Garlic Gold® Oil, and lemon zest and juice to the food processor. Process for about three more one-second pulses, until all of the ingredients are evenly combined into a smooth, ricotta-like mixture. Layer the lasagna: Spoon ½ cup of the marinara sauce into to the bottom of a small (5-quart) roasting pan, or a 13 by 9-inch baking dish. Use your hands to evenly sprinkle ⅓ of the spaghetti squash in an even over the sauce. Sprinkle ⅓ of the zucchini and mushrooms over the spaghetti squash layer. Dollop small spoonfuls of ⅓ of the the ricotta filling evenly over the vegetable layer, then ladle on ⅓ of the remaining marinara sauce. Repeat two more times to use up all of the ingredients. Bake and serve: Cover the pan tightly with aluminum foil. Bake at 375ºF for 20 minutes, then remove the foil and cook for an additional 10 minutes, until the tomato sauce is bubbling and the “ricotta” is a bit browned on top. Remove the lasagna from the oven and allow it to cool for about 10 minutes before serving. Sprinkle liberally with the Parmesan “cheese,” and serve hot.